Russia and China are becoming closer thanks to Obama and his insane policies behind the NSA that have left America trying to find friends in a dark hour. The sanctions being imposed on Russia have sent China into its camp. The USA is finding it increasingly more difficult to be the bully in the school-yard. No former administration has ever acted with such arrogance and blind stupidity than the Obama Administration. The net result is to empower Russia and to inspire a new dynamic-duo of Russia-China against the USA. China supported Russia, when Western countries launched an anti-Russian campaign. With both of their economies turning down, this is by no means the proper time to impose sanctions. All this policy is doing is re-enforcing Putin and placing him in the position where he must become more aggressive or seem weak in the shadow of Obama. In keeping with the idea that the West/America plotted the fall of the Soviet Union as a covert plot rather than the economic collapse of Communism, feeds directly into the idea that the majority of people see whatever happens to them as a victim of someone else rather than the consequences of their own stupidity. Putin’s statements that the fall of the Soviet Union was the greatest tragedy of the 20th Century is gaining momentum in Russia. There is now talk of Mikhail Gorbachev being put on trial. 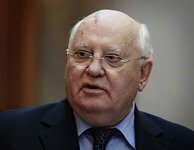 Gorbachev was the last president of the USSR and the proposition to bring him to trial for the collapse of the Soviet Union is being bantered about. This is part of the propaganda machine to enrage the people to justify the invasion of at least Eastern Europe. Putting Gorbachev on trial will be an indictment of the West and further the conspiracy theory that it was a plot and not economics. The treatment of Russia by the Obama Administration has been appalling to say the least even before Crimea. The policies that are in place and the thinking is so outdated built around an ego of self-centered aggrandizement, it is hard to see how this cannot lead to any place other than armed conflict. I stated upfront, give the East Ukraine back to Russia on a timetable and allow free elections there that should have been monitored. The people should have decided this issue, not politicians. That should have been the serious solution just as East Germany was given back to the West. Failing to reach such a negotiated settlement allowing for real free elections has led to this confrontation with no escape. Both sides now have their backs against the wall and neither will back down fearing this will be a sign of political weakness. Putin is playing into the conspiracy of a victim – not that Russia fell because of economics. This is going over very well and this is the danger for therein we find the seeds of war.